Gather round, me hearties, to see a selection of the best swashbuckler signs to be found on land or sea! 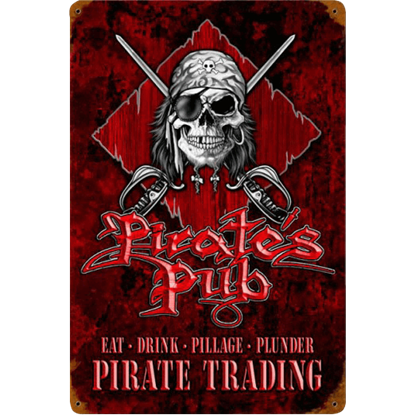 Aspiring buccaneers, young and old, will enjoy the charming look of these double-sided tavern signs and metal pirate signs. 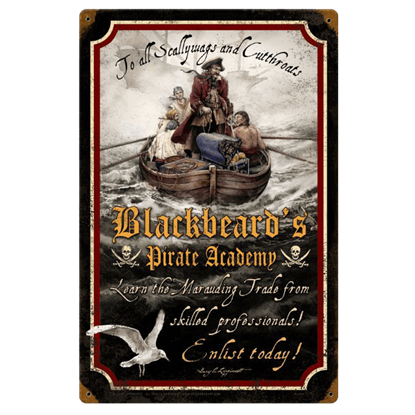 Here in this categorys, we provide many vintage pirate signs featuring clever slogans, puns, and humorous sayings, as well as iconic images like the Jolly Roger and historic ships. Pirates are well-known for loving their ale, rum, and other spirits, and so a good number of these marauder signs display a similar theme. Our pirate wall art is beyond compare, many of the pieces made from American steel with pre-drilled and riveted holes for easy hanging. No matter where in your home these signs are hung, you will be displaying fantastic pirate decor that visitors will be sure to appreciate! WARNING! The area you are in contains pirates. Our Beware of Pirates Sign is all the warning you will need before engaging with dangerous folk. Made from corrugated metal, this stark white, red, and black sign is a must have. 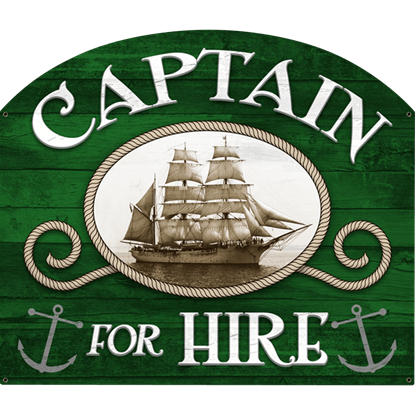 If you are more than willing to undergo an adventure on the high seas, consider hanging the Captain for Hire Metal Sign around your lodgings! The image and text seem to appear on green wood with a curved upper boundary. 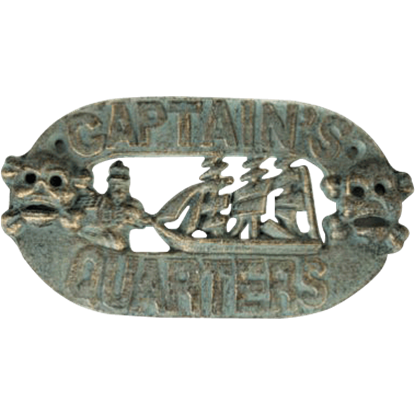 There is no question about where you are when you look towards this tarnished Captains Quarters Sign. Our iron sea captain sign is covered in an antique verdigris patina finish making it look like it has weathered the elements out at sea. Nothing brings in a pirate crowd quite like an ale house or tavern! 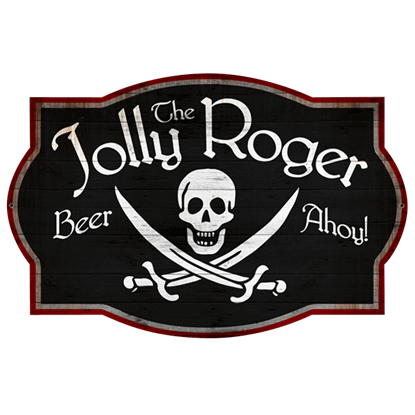 The Double Sided Jolly Roger Tavern Sign resembles an iconic tavern sign that looks like it might have been pulled off the street of an actual pirate port city! Not all pirate treasure is silver, gold, and jewels. 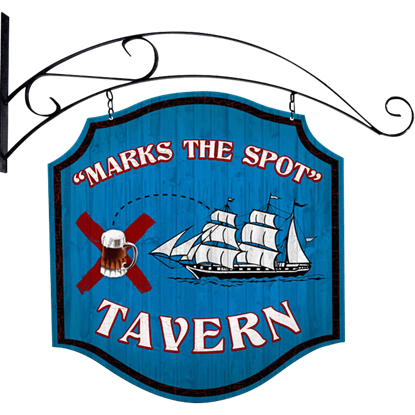 Sometimes the most valuable prize of all is information - like the importance of the drinking establishment that posts this Double Sided Marks the Spot Sign! Treasure hunters are always looking for the next big score. 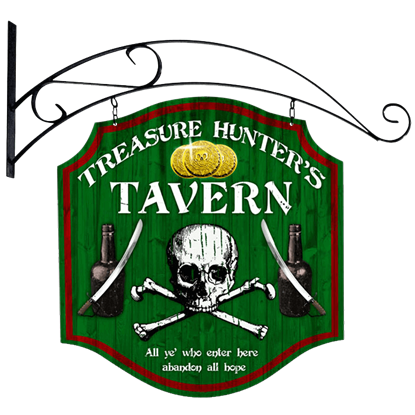 You may have found it with the Double Sided Treasure Hunter Tavern Sign, which recreates the old-fashioned look of a classic tavern sign with a dose of pirate style. Nothing brings in a pirate crowd quite like an ale house or tavern! 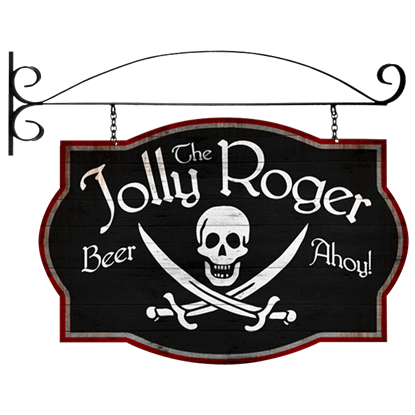 This Jolly Roger Tavern Sign greatly resembles an iconic tavern sign that looks very much like it might have been pulled off the street of an actual pirate port city! 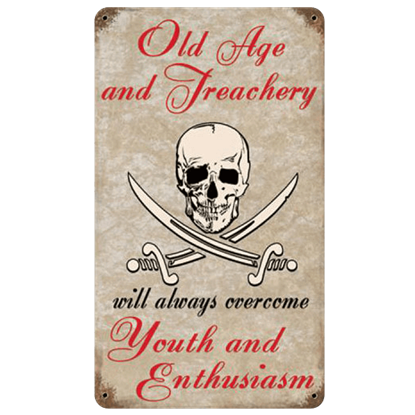 The Old Age Tops Youth Pirate Sign pretty much says everything that needs to be said about aged pirates. 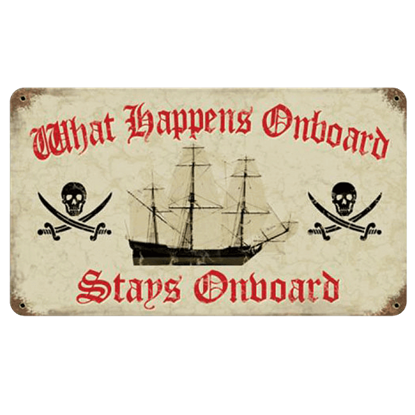 Wit and a bit of humor alongside the classic emblem of piracy makes this a fun sign to have hanging in your captains cabin. The vow of what happens in Vegas stays in Vegas apparently has its roots in an oath from the days of high seas raiding. This Onboard Vow Pirate Sign echoes the same sentiment, proclaiming that what happens onboard stays on board. You cannot just take to the high seas and expect to be a good pirate! The skills of sailing, plundering, and pillaging must be learned! Before you set sail, look for this Pirate Academy Vintage Steel Sign to get some pirate lessons! This sign speaks for itself. 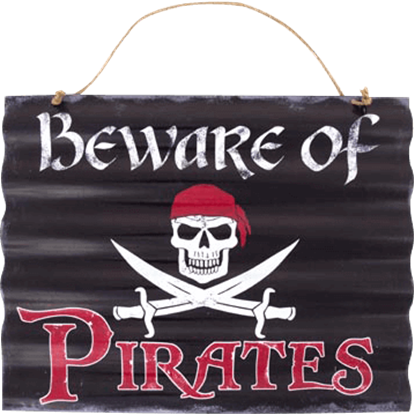 Our Pirates Only Sign depicts a phrase often associated with these dangerous individuals. 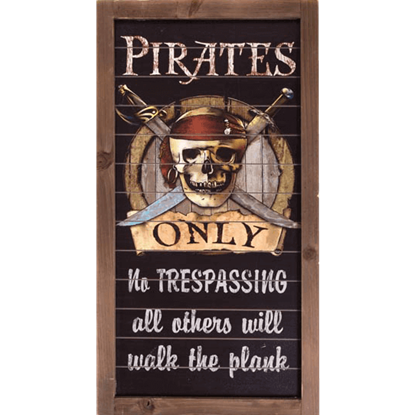 This wooden sign depicts a jolly roger and the ultimatum, Pirates Only No Trespassing All Others Will Walk The Plank. Piracy can be a stressful business, so make sure you always take time to unwind at your nearest pirate-friendly drinking establishment! The Pirates Pub Metal Sign displays a vintage tavern advertisement aimed at swashbucklers.